On Windows Phone 8.1, we had been doing this. Getting the appx files from the web, transfer that to SD Card, and then find it, install it from the store. This was very helpful, especially in countries like India where there are not much FREE WIFI hotspots and people are bound to rely on slow 2G/3G networks and the service providers working hard to raise the hikes. Add to this, the store would prompt you to connect to a WI-FI connection before you even think to download a heavy app/game like Asphalt 8:airborne. Well, now Windows 10 Mobile is here. This was supposed to ease things a bit by removing the WIFI restriction and allow downloads over normal mobile data. It did so. You can now download apps/games on your mobile data. But has it helped anyway? I doubt. Getting the appx file from the web had an added advantage. We could share it among friends and colleagues. But with Windows 10, things have become complicated, there is no possible way to download the app "manually" from the store and install it. At the same time, the manual install/sideload experience has been refined. So, how do you actually get the appx files? There is an un-official way to get them. More on this later. If you own a Windows 10 Mobile device, you are good to go. Follow these steps in order to get your device ready. Head to Settings > Update & Recovery and tap on "For Developers"
You will find three options here. Choose the second one which lets you sideload apps from other sources. Next, transfer/copy the appx file of the app to your Phone/SD Card storage. 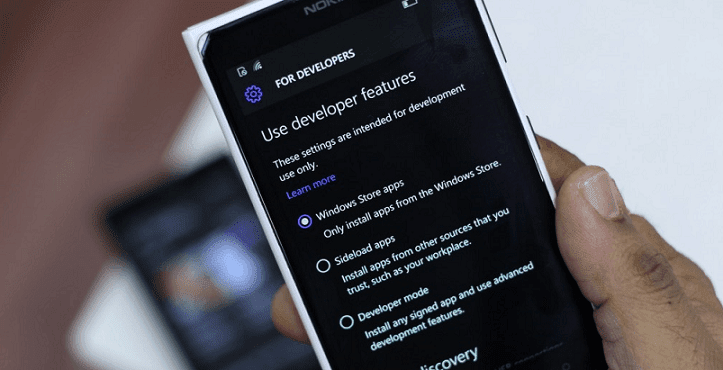 Browse to the file via File Explorer, tap on the file and it will throw an install prompt. If you really want to give it a try, tap Install else tap cancel. If all goes well, you will find the app under the app list under 20 sec. To get the appx files, head to this website. From there, you can download the most-popular apps and games. Give this a try and let us know, whether you could successfully install the apps on your phone, in the comments below. I would really like to hear from you. Please note, this is just a workaround or an unofficial method to get the apps. If anything doesn't work well, don't blame us.